Every time you use your BMO Registered Nurses’ Association of Ontario MasterCard, you identify yourself as a member of your professional association, and show your pride as a registered nurse. RNAO's name and logo are prominently displayed on the card, so you will enjoy the instant recognition of your profession. 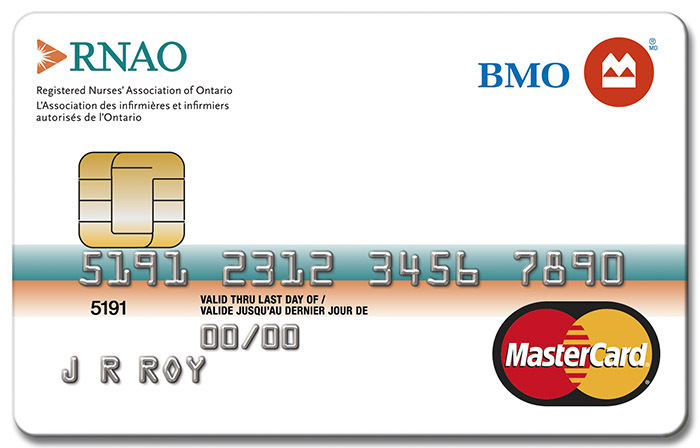 When you use your BMO RNAO MasterCard to make a purchase, you support your association as a contribution is made to RNAO by Bank of Montreal - at no cost to you. 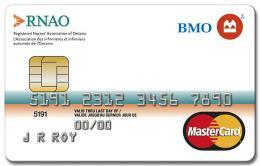 For more details about the BMO Registered Nurses' Association of Ontario MasterCard, call BMO at 1-800-263-2263. 1. Award of AIR MILES reward miles or CashBack is made for purchases charged to your account (less refunds) and is subject to the terms and conditions of your BMO MasterCard Cardholder Agreement. ® Registered trade-mark of Bank of Montreal. ®* MasterCard is a registered trademark of MasterCard International Incorporated. ®† Trademarks of AIR MILES International Trading B.V. Used under license by LoyaltyOne, Inc. and Bank of Montreal.